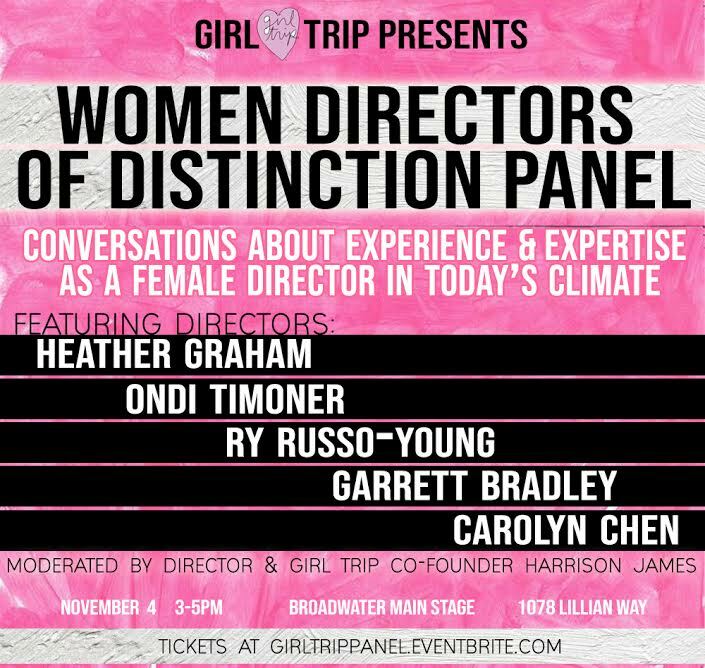 Girl Trip LLC presents the Women Directors of Distinction (in Film) Panel on Sunday, November 4th from 3-5pm at The Broadwater in Hollywood. Each panelist will share her unique perspective on topics such as how to have a thriving career as a filmmaker, the creative process, how to reach your audience and achieve visibility, creating diversity in content and on set, exploring artistic voice and storytelling, and the opportunities and challenges of being a female director in today’s climate. Panelists include feature director & actor Heather Graham, two-time Sundance grand jury prize documentary filmmaker Ondi Timoner, feature & television director Ry Russo-Young, feature director Garrett Bradley, and commercial & brand content director Carolyn Chen. The panel will be followed by a Q+A. This event will be moderated by director & Girl Trip’s co-founder Harrison James. LA Women’s Theatre Festival presents HOT OFF THE PRESS! LAWTF’S Hot Off The Press! !